This term we are stepping into the world of dinosaurs! Making all sorts of new discoveries and finding news information. We can hardly contain our excitement. Today Mrs Mulholland told us that Mrs Riggall has found some extra clues as to who has been going up into forest school and leaving it a mess. She said they left some evidence and asked Mrs Mulholland if we could investigate. We were very excited... until we found out what the evidence was. We were all disgusted and shocked - but did it anyway. To find out which animals have been in forest school we had to dissect the 'poo'! Firstly we had to dress for the occasion and put overalls and safety goggles on. We used special scientific tweezers for each of the 3 poos found. We searched for clues such as animal fur in the poo, or plants and decided whether the animal was a meat eater, planter eater or ate both plants and meat. We loved this lesson! It was a super fun and speedy way to help us remember the definitions and examples of herbivores, carnivores and omnivores. After the lesson we played a really funny quiz (which had sound effects) where we had to identify animal's poo. We also listened to and read the story of The Story of the Little Mole (who knew it was none of his business). Click the links below to play the game or listen to the story. "It looks really big through the glass"
"hmmmmm.... this poo is about 8cm"
"I'll hold it still for you"
"we need to see what is inside it"
"this is a herbivore poo because there is grass"
"I can't believe you are making us do this!" "I need a closer look"
"this one has worms in it"
"the fur is all stuck to the tweezers"
Today Amelia’s Mum brought in a dinosaur skeleton. We looked at the skeleton and discussed the bones that make up the dinosaur. We discussed how the bones help to build the shape of the dinosaur and protect body parts just like ours. Gary wanted to come out with us at the end of the day and share the news with our friends and family. Today was a first day back. 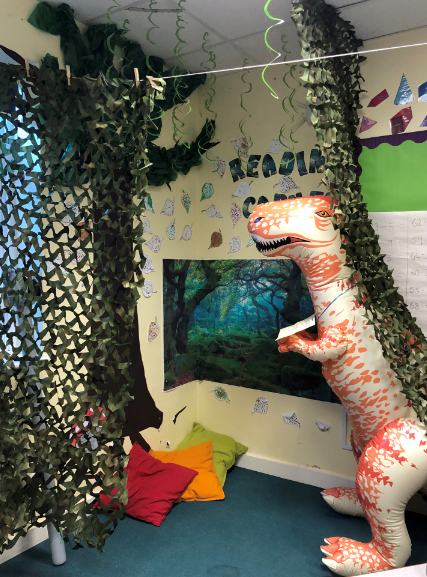 When we walked in we were shocked to find a HUGE 6ft dinosaur in our classroom! We were very excited and very curious. Here is a picture of our dinosaur. We took the dinosaur out with us at the end of the day to show our parents just how big the dinosaur is. They were as shocked as us! we decided though, the dino needed a name and all put in our suggestions. We asked our parents to contribute too. Watch this space for a name!